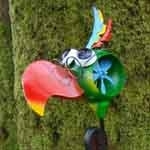 We have a wide range of decorative animal stakes for your home and garden. The variety of different garden stakes we sell are always changing as they are very popular. Great for gardens and plant pots. Great additional to anyone's garden and home. Wonderful as a gift.